Dante's Peak - Pump up the explosions! Felony stupid - an expression I picked up, I think, from author Tim Powers. Felony stupid, felony arrogant and felony greedy are the staples of disaster movies and disaster movie writers. They move the plot along nicely, cause complications, drag our heros back into danger when they seem doomed to happily-ever-after, and for this the sentence is usually death. There are two main categories of capital punishment for these felons - death by their own selfishness, or death by reparation. Dante's Peak is no exception. 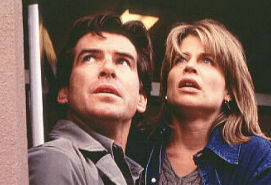 When Rachel's (Linda Hamilton) mother in law Ruth (Elizabeth Hoffman) refuses to leave her mountain out of sheer bloody-minded-ness, Rachel's kids race up the mountain to save Grandma, and Rachel and Dr Harry (Brosnan) race up after them. Ruth later gives her life to save them all. Dante's Peak begins with screams, holocaustal volcanic outpourings and death. Then we see the cute little town with delusions of grandeur. The second most livable town in the U.S.A under 20,000 people. A strange little town, with a concrete overpass worth of L.A., leading to a two-lane plank bridge. Hmmm. I think the special effects guys have way too much time on their hands. Which is surprising really since they spent a lot of time reducing a sweet little backwoods town of 7,000 people to a vast sea of grey ash. If you like loud noises and lots of explosions, this is your kind of movie, if you just like to gawk at a pretty actor (male or female) this could be for you. Visually stimulating, emotionally thin: the mountain has the best role. Hi. I just finished reading your review, and I wanted to let you now one thing about it. You expressed disbelief over the massive overpass in such a dinky town. Does werple.net.au mean Australia or Auckland? The reason I ask is because, here in the U.S., we spend serious(ly stupid) money to do things BIG. There is a very small town here in Vermont, USA called Island Pond, maybe 1500 people in the summer. They have a giant cement and steel overpass to clear the railroad tracks. It used to be a pretty wood and iron bridge, but I guess that with Dept of Transportation money they were able to do it right. It isn't as big as the bridge in the movie but I think it is proportional, relative to population size. I'm sorry to say it, but the bridge was totally realistic. BTW, Dante's Peak was awful, I'm sorry I saw it. I couldn't sleep for a week. Best damn disaster flick I ever saw.